Wearing dreadlocks can be a great way to have fun with your hair and to make it look bigger and more spectacular. Unfortunately, if you don't know how to look after your dreads, they can cause long-term problems for your hair, including root damage which leads to Permanent Hair Loss. What do you need to know to carry on enjoying your look for years to come? Although healthy dreadlocks can protect your hair, dreadlocks that have been badly made often cause Stress On The Scalp and can tug hair out at the roots, resulting in follicular damage and a gradual thinning process. This is particularly problematic if your dreads are decorated with woollen or fabric extensions, as extra weight means extra strain. The best way to make sure your dreadlocks are put in properly is to get them done by an experienced professional or somebody who has personally worn them for a long time. Ideally the dreading process should start when your hair is short. This will give you more control over how the dreads are formed and will prevent them from pulling hair too far sideways across your scalp. If you already have thin hair you should be aware that, although they will bulk it out, dreadlocks will not make it look thicker at the scalp. In fact, they can do the opposite, making thin areas more visible. If your hair is thinning in patches, however, your stylist may be able to conceal these to an extent when forming your dreads. 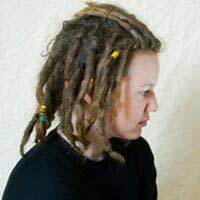 Because of their size, dreadlocks are less likely than loose hair to get caught in things like clothing and pulled at the root. Over time, however, they can accumulate damage. They may feel strong, but tugging can gradually loosen individual hairs to the point where your dreads are not properly secured to your scalp. Avoid twisting at the hair after the initial styling process as this can cause extra strain at the roots. It is a myth that dreadlocks work better in dirty hair, but sadly this myth is so common that many people do not look after their dreads properly. This can lead to infections of the scalp and consequent Hair Loss. Sometimes permanent damage can occur. One of the reasons why dreadlocks cannot be left to 'clean themselves naturally' is that, unlike loose hair, they do not draw oils away from the scalp. This can lead to follicles being suffocated. You can protect your dreads by washing them regularly with a shampoo designed for oily hair, which will protect the scalp. Avoid using conditioner. The structure of properly made dreads will protect them from drying out. If you suffer from Male Pattern Baldness and have a receding hairline, your dreads may exacerbate the problem by pulling on sensitive skin in this area. You can protect them by wearing a stretchy dreadband (even while you sleep). This will also help to hide the baldness and balance out your style. Inevitably, long hair of any kind stresses the scalp. This can be worse with dreadlocks because hair that would usually be shed instead remains twisted into the dreads, meaning that, over time, there is additional weight on the roots. This can cause traction alopecia. The best way to protect yourself against these problems is to wear your hair in a style that supports it against the top of your head, reducing the strain on the roots. This can mean tying it up (being careful not to do so too tightly) or wearing it inside a soft, breathable hat that provides support. You can still wear your dreads loose for special occasions, but if you look after them in this way you're a lot less likely to lose your hair. Find out more about alopecia and its causes in our features What Is Alopecia? and Can You Treat Alopecia?. I can tell my hair is thinning mainly at the top of my head. What should I do? My dreads stop at my lower back or a little lower, but I don’t want to cut them. I also wanted to know what I should wash them with? I think I go too long without washing them. Any advice will help. Thank you!